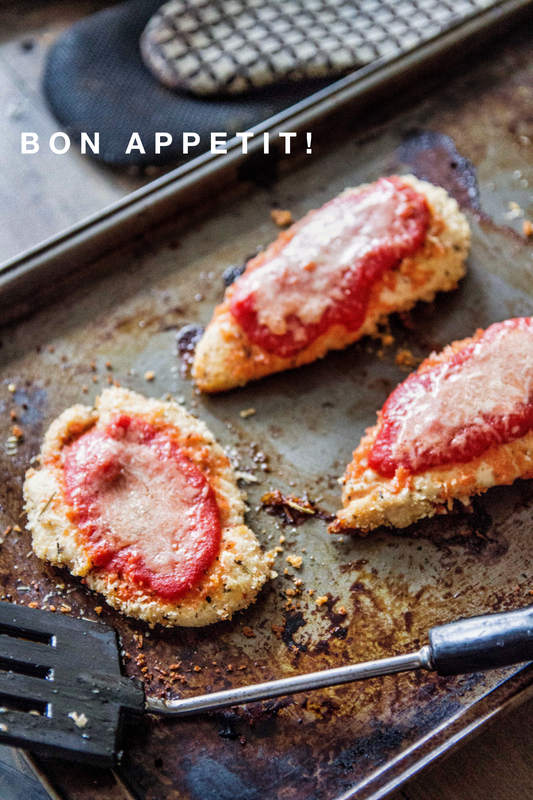 This recipe is very near and dear to my heart as it is the first ‘real’ dinner I created that didn’t come from a box in the frozen food section at the grocery store. I came upon it when Pinterest was still shiny and new, years and years ago, and the creator of this recipe promised it was foolproof. Having been known to set fire alarms off, and ruin toast, I decided to take the risk. Well she was right. It was easy and it was perhaps the reecipe that was responsible for instilling in me a love for healthy, homemade food, and eliminating the fear that came along with cooking my own meals. When friends ask me what meal they should start off making to get their foot into the world of cooking, I suggest this one. And this wouldn’t be a recipe I endorse and put my name on if I didn’t modify it to include copious amounts of cheese. So be sure to have your micro grater and fresh slab of Parm cheese ready to go. I find that when baking chicken rather than frying or grilling, the chicken tends to rise quite a bit and the meat becomes “fluffy” and sometimes teetering on dry in texture. To compensate, I like slicing my breasts in half lengthwise so that the chicken does not ‘puff up’ as much, and also so I can trick myself into eating less meat than I typically would. Eating “two” breasts is really only eating one that has been cut in half. Be very careful of the amount of garlic salt you add to your breadcrumb mixture. I suggest measuring this exactly as putting even a smidge too much garlic salt can ruin your dish (I speak from too much experience, sadly). Sometimes less is more! There are traditional ways of breading chicken that use egg and flour. While I do use these methods sometimes, I generally find it more necessary when frying my chicken/fish instead of baking it. I like massaging butter or olive oil into the chicken and manually pressing the breadcrumb mixture in the filets a few times until theres a nice even layer on of crumb coating on the filet. It will not stick as well as egg and flour, but it works just fine. You can argue that it’s the healthier option but honestly, I am a bit of a lazy cook who is always looking for shortcuts. 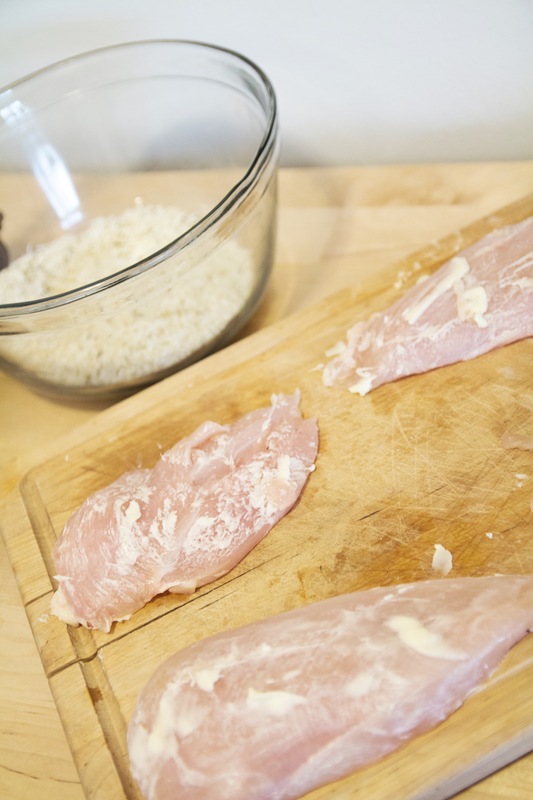 Place hand on top of chicken cutlet, make incision halfway through the width, and evenly cut through the chicken lengthwise. 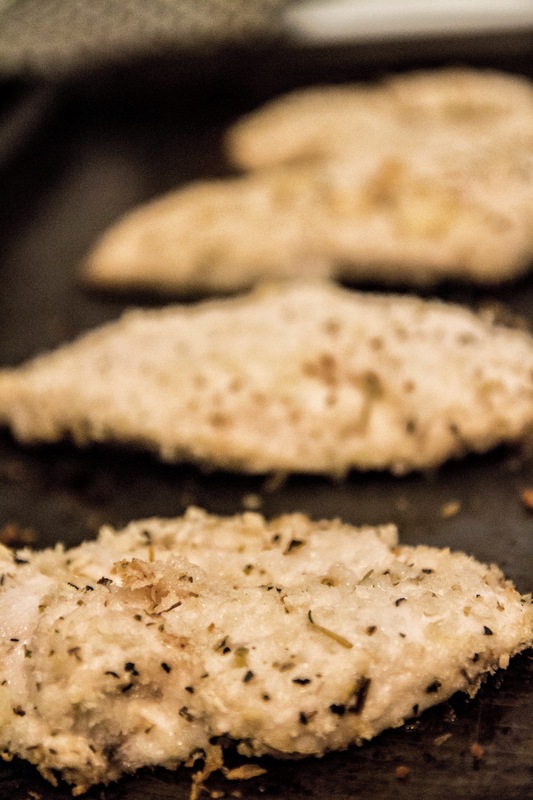 Repeat with second breast, making four thin chicken cutlets. Take butter and using your fingers, rub it in, around, and all over the four cutlets until well butter is well massaged in. 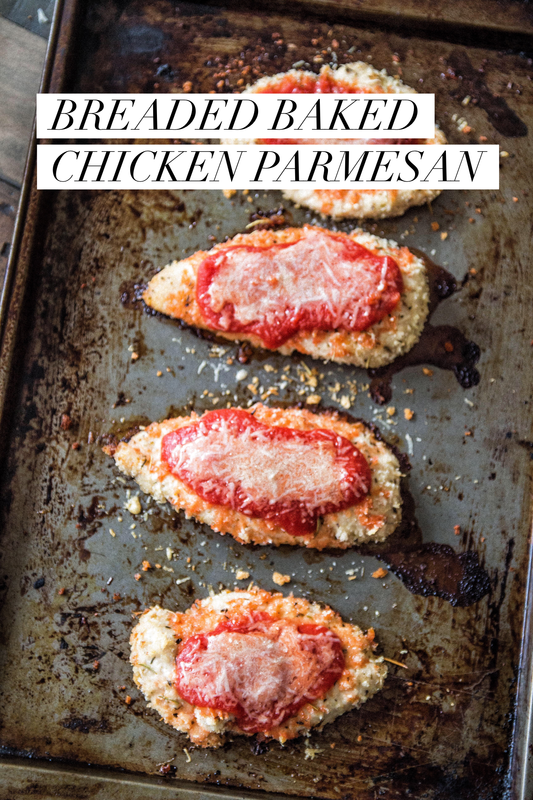 Combine breadcrumbs, garlic salt, herbes de provence, pepper, salt, 3/4 cup of Parmesan cheese and 1 tbsp Romano cheese. Roll each cutlet into breadcrumb mixture until well covered. 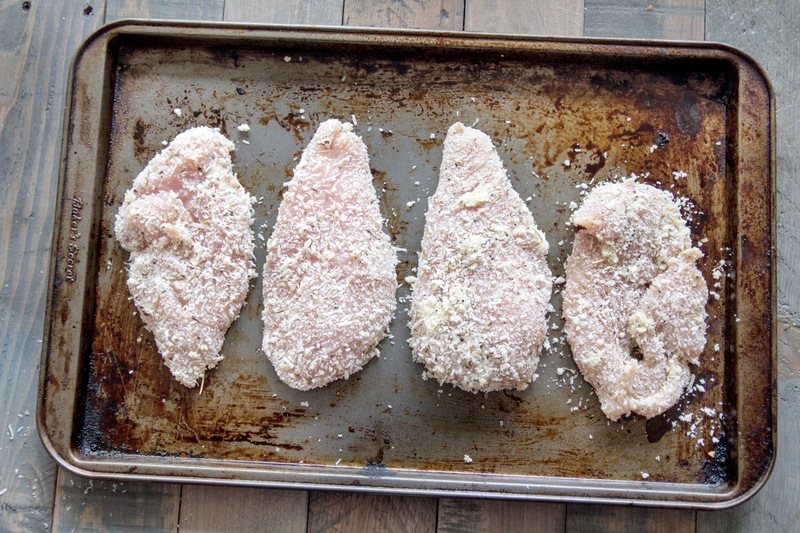 Place all four cutlets onto a baking tray, and bake for 20 minutes. 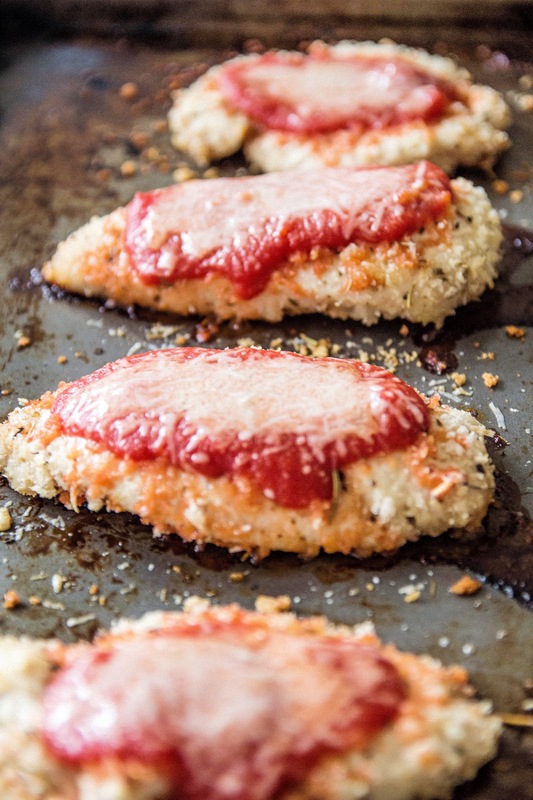 Remove from oven, spoon marinara sauce onto each cutlet, and generously sprinkle remaining cheese on top. Bake for 5 more minutes, then broil on low for 1-2 minutes. Have you made some variation of a baked chicken like this at some point? I would love to hear your take! Have you tried placing the chicken on a cookie rack and then on the baking sheet? (The cookie rack’s feet are collapsed under it, so the rack is only a few centimeters tall.) I find this keeps the underside of the breaded chicken nice and crisp. This is an awesome idea! I usually use a 9×9 baking pan when making chicken for myself but I will have to try this tip out for larger quantities. It would save me from having to flip the chicken near the end of cooking which I always find a hassle.